On April 19, Drexel University received two grants totaling $2.6 million to be used to improve access to early childhood education in West Philadelphia. A $1.63 million grant was awarded by the Vanguard Strong Start for Kids Program, and the William Penn Foundation, which has previously supported Drexel’s early learning initiatives, provided an additional grant worth $987,000. Both grants will be used to support early education in the West Philadelphia Promise Zone, through a program that will be headed by Drexel’s Action for Early Learning Initiative for the next three years. Formed in 2014, AFEL is a collaboration led by Drexel between social service, education and community agencies with an aim to improve the quality of early childhood education in the West Philadelphia Promise Zone, an education system for families in the high-need, high-poverty area, modeled after the Harlem Children’s Zone in New York. The organization strives to increase access to high-quality early childcare, as well as to foster families’ awareness and knowledge of the importance of high-quality care, primarily ensuring that children are kindergarten-ready when they enter school and are capable of reading at grade level by third grade. According to AFEL Project Director Maria Walker, research shows the long-term benefits of high quality early childhood education in determining a child’s success. “Children who are kindergarten ready and reading by third grade are more likely to graduate from high school and continue with post-secondary training or college. These two grants will go a long way to supporting children and families in the community,” she said. AFEL plans to support early childhood education teachers through training and technical assistance, as well as promoting Pre-K social and emotional skill building. The grant from the Vanguard Strong Start for Kids Program will further help expand the AFEL Family Ambassador program to reach more families and support in the implementation of AFEL “Family University” to promote a community-based parenting education program. AFEL grew out of a William Penn Foundation planning grant, which revealed the dearth of high-quality early childcare providers and its negative impact on neighborhood children’s kindergarten readiness. 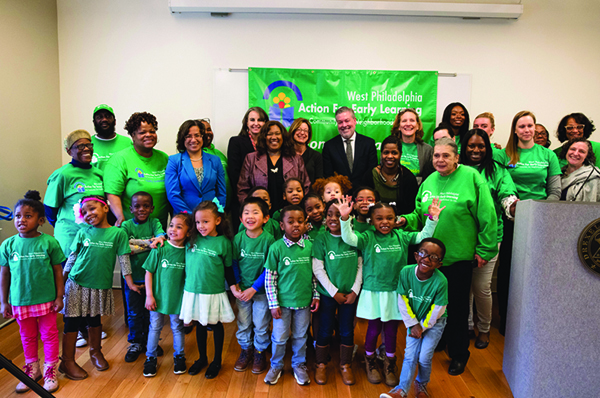 AFEL has made significant improvements in the Promise Zone since its inception in 2014: 26 percent more local children enrolled in high-quality care, 48 percent increase in the number of childcare providers to improve their quality rating and a 13 percent improvement in the average early literacy scores among West Philadelphia children. According to the DrexelNow announcement, the grants will help both initiatives push even further.